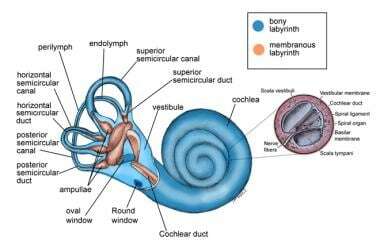 These sensory organs include the utricle, saccule, semicircular canals, and cochlea. Symptoms of labyrinthitis occur when infectious microorganisms or inflammatory mediators invade the membranous labyrinth and damage the vestibular and auditory end organs. The labyrinth lies within the petrous portion of the temporal bone adjacent to the mastoid cavity and connects with the middle ear at the oval and round windows. The labyrinth maintains connections with the central nervous system (CNS) and subarachnoid space by way of the internal auditory canal and cochlear aqueduct. Bacteria may gain access to the membranous labyrinth by these pathways or through congenital or acquired defects of the bony labyrinth. Viruses may spread to labyrinthine structures hematogenously or by way of the aforementioned preformed pathways. Viral and bacterial labyrinthitis are sufficiently different to warrant discussing them as separate disease processes. Although bacterial labyrinthitis is rare in the postantibiotic era, bacterial meningitis remains a significant cause of hearing loss. Auditory symptoms, vestibular symptoms, or both may be present in as many as 20% of children with meningitis. Meningitis typically affects both ears, whereas otogenic infections typically cause unilateral symptoms. In patients with meningitis, bacteria can spread from the cerebrospinal fluid to the membranous labyrinth by way of the internal auditory canal or cochlear aqueduct. Bacterial infections of the middle ear or mastoid most commonly spread to the labyrinth through a dehiscent horizontal semicircular canal. Usually, the dehiscence is the result of erosion by a cholesteatoma. Suppurative labyrinthitis resulting from otitis media is uncommon in the postantibiotic era. When suppurative labyrinthitis occurs, it is almost always associated with cholesteatoma. Profound hearing loss, severe vertigo, ataxia, and nausea and vomiting are common symptoms of bacterial labyrinthitis. Serous labyrinthitis occurs when bacterial toxins and host inflammatory mediators, such as cytokines, enzymes, and complement, cross the round window membrane, causing inflammation of the labyrinth in the absence of direct bacterial contamination. This condition is associated with acute or chronic middle ear disease and is believed to be one of the most common complications of otitis media. Toxins, enzymes, and other inflammatory products infiltrate the scala tympani, forming a fine precipitate just medial to the round window membrane. Penetration of the inflammatory agents into the endolymph at the basilar turn of the cochlea results in a mild to moderate, high-frequency SNHL. Audiometric testing reveals a mixed hearing loss when a middle ear effusion is present. Vestibular symptoms may occur but are less common. Treatment is aimed at eliminating the underlying infection and clearing the middle ear space of effusion. The hearing loss is usually transient but may persist if the otitis is left untreated. The bacteria that cause labyrinthitis are the same bacteria responsible for meningitis and otitis. Gram-negative organisms are found more commonly when cholesteatoma is the inciting factor. Viral labyrinthitis is usually observed in adults aged 30-60 years and is rarely observed in children. Meningogenic suppurative labyrinthitis is usually observed in children younger than 2 years, which is the population most at risk for meningitis. Otogenic suppurative labyrinthitis can be observed in persons of any age in the presence of cholesteatoma or as a complication of untreated acute otitis media. Serous labyrinthitis is more common in the pediatric age group, in which the vast majority of acute and chronic otitis media cases are observed. The acute symptoms of vertigo and nausea and vomiting resolve after several days to weeks in all forms of labyrinthitis; however, hearing loss is more variable. Suppurative labyrinthitis nearly always results in permanent and profound hearing loss, whereas patients with viral labyrinthitis may recover from hearing loss. Dysequilibrium and/or positional vertigo also may be present for weeks following resolution of the acute infection. Deaths associated with labyrinthitis are not reported except in cases of meningitis or overwhelming sepsis. The morbidity of labyrinthitis, especially bacterial labyrinthitis, is significant. Bacterial labyrinthitis, regardless of etiology, accounts for one third of all cases of acquired hearing loss. Ménière disease may follow an episode of suppurative or serous labyrinthitis and is most likely due to fibrosis of the endolymphatic sac and altered Na+/K+ transport. For patient education information, see the Ear, Nose and Throat Center, as well as Labyrinthitis and Vertigo. Schraff SA, Schleiss MR, Brown DK, Meinzen-Derr J, Choi KY, Greinwald JH, et al. Macrophage inflammatory proteins in cytomegalovirus-related inner ear injury. Otolaryngol Head Neck Surg. 2007 Oct. 137(4):612-8. [Medline]. Kuhweide R, Van de Steene V, Vlaminck S, Casselman JW. Ramsay Hunt syndrome: pathophysiology of cochleovestibular symptoms. J Laryngol Otol. 2002 Oct. 116(10):844-8. [Medline]. Hato N, Kisaki H, Honda N, Gyo K, Murakami S, Yanagihara N. Ramsay Hunt syndrome in children. Ann Neurol. 2000 Aug. 48(2):254-6. [Medline]. Wu JF, Jin Z, Yang JM, Liu YH, Duan ML. Extracranial and intracranial complications of otitis media: 22-year clinical experience and analysis. Acta Otolaryngol. 2012 Mar. 132 (3):261-5. [Medline]. Wu JF, Jin Z, Yang JM, Liu YH, Duan ML. Extracranial and intracranial complications of otitis media: 22-year clinical experience and analysis. Acta Otolaryngol. 2012 Jan 8. [Medline]. Gulya AJ. Infections of the labyrinth. Bailey BJ, Johnson JT, Pillsbury HC, Tardy ME, Kohut RI, eds. Head and Neck Surgery-Otolaryngology. Philadelphia, Pa: JB Lippincott; 1993. Vol 2: 1769-81. Berlow SJ, Caldarelli DD, Matz GJ, Meyer DH, Harsch GG. Bacterial meningitis and sensorineural hearing loss: a prospective investigation. Laryngoscope. 1980 Sep. 90(9):1445-52. [Medline]. Jang CH, Park SY, Wang PC. A case of tympanogenic labyrinthitis complicated by acute otitis media. Yonsei Med J. 2005 Feb 28. 46(1):161-5. [Medline]. Schuknecht HF, Kitamura K. Second Louis H. Clerf Lecture. Vestibular neuritis. Ann Otol Rhinol Laryngol Suppl. 1981 Jan-Feb. 90(1 Pt 2):1-19. [Medline]. Harris JP, Ryan AF. Fundamental immune mechanisms of the brain and inner ear. Otolaryngol Head Neck Surg. 1995 Jun. 112(6):639-53. [Medline]. Broughton SS, Meyerhoff WE, Cohen SB. Immune-mediated inner ear disease: 10-year experience. Semin Arthritis Rheum. 2004 Oct. 34(2):544-8. [Medline]. Byl FM. Seventy-six cases of presumed sudden hearing loss occurring in 1973: prognosis and incidence. Laryngoscope. 1977 May. 87(5 Pt 1):817-25. [Medline]. Baloh RW, Honrubia V, Jacobson K. Benign positional vertigo: clinical and oculographic features in 240 cases. Neurology. 1987 Mar. 37(3):371-8. [Medline]. Woolley AL, Kirk KA, Neumann AM Jr, McWilliams SM, Murray J, Freind D. Risk factors for hearing loss from meningitis in children: the Children's Hospital experience. Arch Otolaryngol Head Neck Surg. 1999 May. 125(5):509-14. [Medline]. Bohr V, Paulson OB, Rasmussen N. Pneumococcal meningitis. Late neurologic sequelae and features of prognostic impact. Arch Neurol. 1984 Oct. 41(10):1045-9. [Medline]. Lee H, Kim HJ, Koo JW, Kim JS. Progression of acute cochleovestibulopathy into anterior inferior cerebellar artery infarction. J Neurol Sci. 2009 Mar 15. 278(1-2):119-22. [Medline]. Bovo R, Ciorba A, Martini A. The diagnosis of autoimmune inner ear disease: evidence and critical pitfalls. Eur Arch Otorhinolaryngol. 2009 Jan. 266(1):37-40. [Medline]. Mark AS, Seltzer S, Nelson-Drake J, Chapman JC, Fitzgerald DC, Gulya AJ. Labyrinthine enhancement on gadolinium-enhanced magnetic resonance imaging in sudden deafness and vertigo: correlation with audiologic and electronystagmographic studies. Ann Otol Rhinol Laryngol. 1992 Jun. 101(6):459-64. [Medline]. Kopelovich JC, Germiller JA, Laury AM, Shah SS, Pollock AN. Early prediction of postmeningitic hearing loss in children using magnetic resonance imaging. Arch Otolaryngol Head Neck Surg. 2011 May. 137(5):441-7. [Medline]. Peng R, Chow D, De Seta D, Lalwani AK. Intensity of gadolinium enhancement on MRI is useful in differentiation of intracochlear inflammation from tumor. Otol Neurotol. 2014 Jun. 35 (5):905-10. [Medline]. Maire R, van Melle G. Diagnostic value of vestibulo-ocular reflex parameters in the detection and characterization of labyrinthine lesions. Otol Neurotol. 2006 Jun. 27(4):535-41. [Medline]. Strupp M, Zingler VC, Arbusow V, Niklas D, Maag KP, Dieterich M, et al. Methylprednisolone, valacyclovir, or the combination for vestibular neuritis. N Engl J Med. 2004 Jul 22. 351(4):354-61. [Medline]. Barkdull GC, Vu C, Keithley EM, Harris JP. Cochlear microperfusion: experimental evaluation of a potential new therapy for severe hearing loss caused by inflammation. Otol Neurotol. 2005 Jan. 26(1):19-26. [Medline]. Klein M, Koedel U, Pfister HW, Kastenbauer S. Meningitis-associated hearing loss: protection by adjunctive antioxidant therapy. Ann Neurol. 2003 Oct. 54(4):451-8. [Medline]. Cohen HS, Kimball KT. Decreased ataxia and improved balance after vestibular rehabilitation. Otolaryngol Head Neck Surg. 2004 Apr. 130(4):418-25. [Medline]. Wei BP, Mubiru S, O'Leary S. Steroids for idiopathic sudden sensorineural hearing loss. Cochrane Database Syst Rev. 2006 Jan 25. CD003998. [Medline]. Battaglia A, Burchette R, Cueva R. Combination therapy (intratympanic dexamethasone + high-dose prednisone taper) for the treatment of idiopathic sudden sensorineural hearing loss. Otol Neurotol. 2008 Jun. 29(4):453-60. [Medline]. Plontke SK, Löwenheim H, Mertens J, Engel C, Meisner C, Weidner A, et al. Randomized, double blind, placebo controlled trial on the safety and efficacy of continuous intratympanic dexamethasone delivered via a round window catheter for severe to profound sudden idiopathic sensorineural hearing loss after failure of systemic therapy. Laryngoscope. 2009 Feb. 119(2):359-69. [Medline]. Westerlaken BO, Stokroos RJ, Dhooge IJ, Wit HP, Albers FW. Treatment of idiopathic sudden sensorineural hearing loss with antiviral therapy: a prospective, randomized, double-blind clinical trial. Ann Otol Rhinol Laryngol. 2003 Nov. 112(11):993-1000. [Medline].